Edinburgh City manager James McDonaugh is viewing tonight’s rearranged trip to Forthbank to face Stirling Albion as something of a free hit. City were due to face the Binos a month ago only for the weather to force a postponement, and this week’s forecast means an eye will need to be kept on potentially freezing conditions in the run up to kick-off. 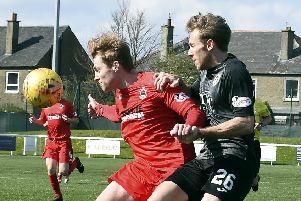 McDonaugh’s team were certainly red-hot at the weekend, turning in their best display of the season to produce a record SPFL win with a 4-0 demolition of Elgin at Ainslie Park. Dave MacKay’s side will be a different proposition, however. They currently sit third in the Ladbrokes League Two table having won five games in succession. While McDonaugh would love to head back down the M9 with a result, there is also Saturday’s clash with bottom club Cowdenbeath in the back of his mind. With the Blue Brazil at Stenhousemuir tonight and trailing City by 12 points, there is the potential for that to have grown to as much as 18 by Saturday evening. McDonaugh still has a lengthy injury list to contend with and admitted that he’s only likely to be able to cross one name off of it – Scott Shepherd must completely pass a concussion protocol – before kick-off. “We probably won’t have any more bodies available,” he revealed. “Maybe one at the most. Everybody’s been struggling. It’s just incredible the injuries we’ve been getting. Every week it’s somebody else with some freak accident or injury. For player/assistant manager Craig Beattie, the benefits of playing again so soon after a fine victory depends on where you are on the age spectrum. “For the young boys, maybe – if you’re 34 and carrying, I’m not so sure!” he laughed. The prospect of increasing the gap to Cowdenbeath is a welcome one, but not a major focusing point as far as the former Hearts striker is concerned. “Things didn’t go Cowden’s way at the weekend so it’s up to us to press on and do what we need to do,” he said. “I think we need to be looking up the way. We’re four points behind Berwick, who nicked a point at the weekend. After not starting the season particularly well, changing management, a lot of players in and out, the objective at the present moment is to stay in the league and we’ve given ourselves a super opportunity to do that.